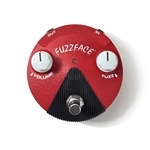 The Fuzz Face Mini pedal line features legendary Fuzz Face tones in smaller, more pedalboard-friendly housings with several modern appointments: true bypass switching, a bright status LED, an AC power jack and a convenient battery door. 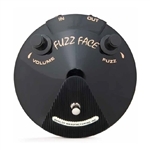 The FFM1 Silicon Fuzz Face Mini is spec’d from a 1970 Fuzz Face in our own collection prized for its bright and aggressive Fuzz Face sound delivered by its matched BC108 silicon transistors. Don't let its small size fool you-the CBM95 Cry Baby Mini Wah doesn't skimp on tone or usability. It comes equipped with the legendary Fasel inductor, a full sweep range, and three internally adjustable voicings-Low, Vintage, and GCB95. At half the size of a standard Cry Baby pedal, the CMB95 is perfect wherever space comes at a premium, such as on a travel board. To top it off, this pedal features true-bypass switching and high-quality hardware so that it can take a beating on the road. Save precious space without sacrificing tone and put a Cry Baby Mini Wah on your pedalboard. Over the course of '69-'70, Jimi Hendrix appeared at a few of his most noted live appearances - Live at Woodstock, Live at Berkeley, and Live at the Fillmore East - using a mysterious red Fuzz Face Distortion with white knobs. That fuzz box sounded like a completely different animal from any of the other Fuzz Face pedals in Jimi's arsenal, snarling with a far more aggressive, biting tone. The pedal itself has been lost to history, but its unmistakably unique tone lives on in the recordings of those three iconic shows, and Hendrix aficionados have tried to cop that sound for years. We are happy to say that their tonal quest can finally come to a glorious end. Poring tirelessly over all of the different customized circuit designs Jimi used over the years, Dunlop's engineers narrowed down this elusive fuzz tone to a version of the Octavio circuit that didn't have the octave up signal. After making a few tweaks, they nailed it. Now, you can get the same Fuzz Face tone Jimi used to woo the masses at some of his most famous performances. It comes in a pedalboard-friendly Fuzz Face Mini housing, complete with an AC power jack and an on/off status LED. The Jim Dunlop Eric Johnson Signature Fuzz Face distortion guitar effects pedal was built to EJ’s precise specifications. When you think about Eric Johnson, you think tone, and the tone he's best known for is his sweet, singing, lead tone. His choice for getting that tone has always been the Fuzz Face. Hand wired using NOS Russian military germanium transistors, this pedal is voiced specifically for Joe's humbucker-driven tone, adding sustain and thivkness for a rich, creamy fuzz. True bypass, with replicas of vintage top hat knobs, and a deep and rich gloss black finish.